Docks and Decks Like Landscape Lighting, Too! Go Back to the Homepage / Docks and Decks Like Landscape Lighting, Too! Is your dock or deck feeling left out? Often when we think about landscape lighting we think of – you guessed it – the landscape. Typical installations include the front of the house, pathways, and large plant material. But what about your deck or dock? Doesn’t it deserve to join the party? Solar lights are a great way to start, but if you have an existing low-voltage system or are in the market for one, adding your deck or dock will provide years of return. 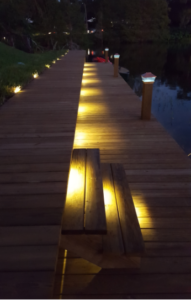 We recently installed landscape lighting on a dock for a client in Orlando. This included mounting lights under the ridge of the dock surfaces to shine light down the face of the dock walls, underwater lights at the base of the stairs leading down into the lake, and in ground fixtures to shine across the surface of the top tier to provide a pathway. Care was taken to ensure all wiring was hidden, all fixtures secure, and all spacing implemented just right. We think we pulled it off, don’t you? You can see more of this project in our Project Gallery where we provide details and additional photos. Total Sprinkler and Lighting is committed to work done in a professional manner, completed on time and on budget, with communication from start to finish. We pride ourselves on a job well done. In fact, we’ve built our Central Florida reputation on it. Make sure to check back regularly for updates to our Blog and Project Gallery. And if you’re in the market, give us a call. We’d love to talk to you.